LOL! Laura, you are a treasure. Love your blog, it’s so upbeat! I wish I knew which group my clematis belongs in. I suspect Group 2. There is scattered new growth now but 80% of it is old, dead looking leaves. It is 8 feet tall, 5 feet wide and (I’m sorry to say) I’ve never pruned it. I’m looking forward to your Group 2 instructions on what to do with this mass! Thank you for commenting! Why do you suspect your clematis is pruning group 2? When does it bloom and how do the blooms look (color, size, shape)? 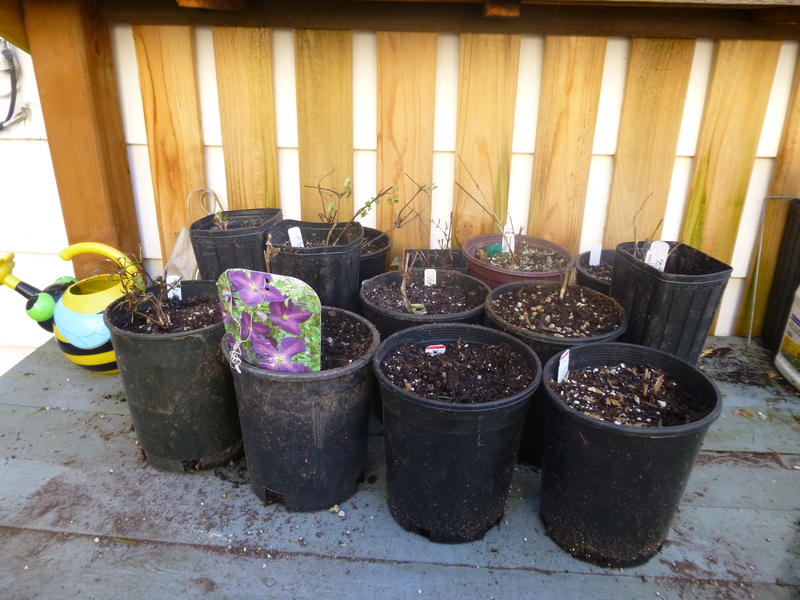 At any rate, stay tuned, Juliana, because I hope to get good photos from the clematis pruning workshop in my garden on Thursday so I can clearly demystify the how-to of Pruning Group 2. The flowers are large, deep purple/blue with yellow centers and 4 or 5 sepals. From somewhere in my memory comes the name Jackmanii.It blooms in May (I think) and a get a few more blooms in early autumn. Thank you for replying, I’m looking forward to the photos! Thank you for sending more information about your clematis, Juliana. I am still not sure which clematis you have, though. Jackmanii, a wonderful and floriferous dark purple clematis with a yellow center, normally blooms from about late June into August, but rarely as early as May. However, if you live in a really warm climate, I suppose it could bloom in May. I would suggest that you prune it like a Pruning Group 2 Clematis (light pruning) for now. Then when it blooms, send me a photo–maybe I’ll be able to determine for sure which clematis it is. I am working now on a how-to post that will describe, with photos, how to prune this group, so stay tuned. I hope to get the post out today or tomorrow.